By printing names on both sides of place cards, you can assist guests with finding their seat as well as help everyone else at the table know their name. Assigning a seat to all attendees is labor intensive, but it is best way to ensure there are no empty seats and that you have an institute representative at each table. You can mix and match tables, chairs or even linens at an event, but it should still have a pattern to it. The more you line everything up, the cleaner a room will look and feel. Check to ensure all of the silverware is set up correctly, the chairs are all the same distance from the table, and any additional materials (notepads, menu cards, etc.) appear in the same spot. Linens should always be draped over rental tables being used for registration, dining, etc. Linens come in various shapes and sizes. Consult the table linen size chart to determine the appropriate linen size to fit your specific table. Discuss with your vendor which colors and materials are available. White and black tend to be standard, as does a poly blend, but you may also have the option of renting a more vibrant color or heavier linen. Because light tablecloths and napkins can leave lint on guests’ dark-colored clothing, discuss the materials used with your vendor to ensure you make the best selection. Consider adding overlays to make your table pop. Don’t forget napkins! They probably won’t be included in your linen costs, but the price should be less than or around $1.00 each. Delivery, installation, and pickup charges will likely be added to your linen order, so be sure to request an itemized account of all charges so you can review the breakdown of costs and double-check the total. Brandon Ford in Staging can assist with 6’ rectangular tables. He does not charge for table and chair rental, but he does charge a delivery, installation, and pickup fee. Requests should be made at least four weeks in advance to ensure availability. Just east of campus near the historic Fourth Ward Park, Halls is the largest flower wholesaler in Atlanta and is a great resource. 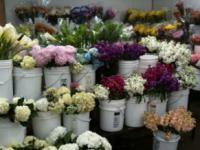 They carry everything from floral hard goods, to potted plants, and to fresh cut flowers.